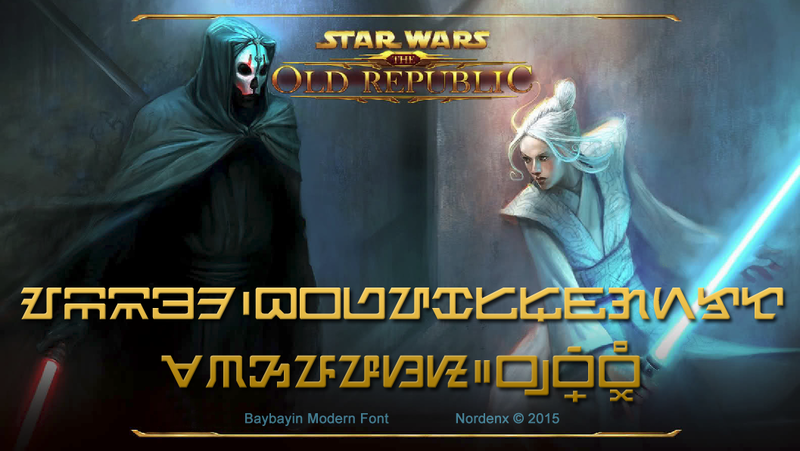 I shown a work in progress (WIP) of this Star Wars inspired font earlier this year, the typeface is styled after the lore's Aurebesh script. 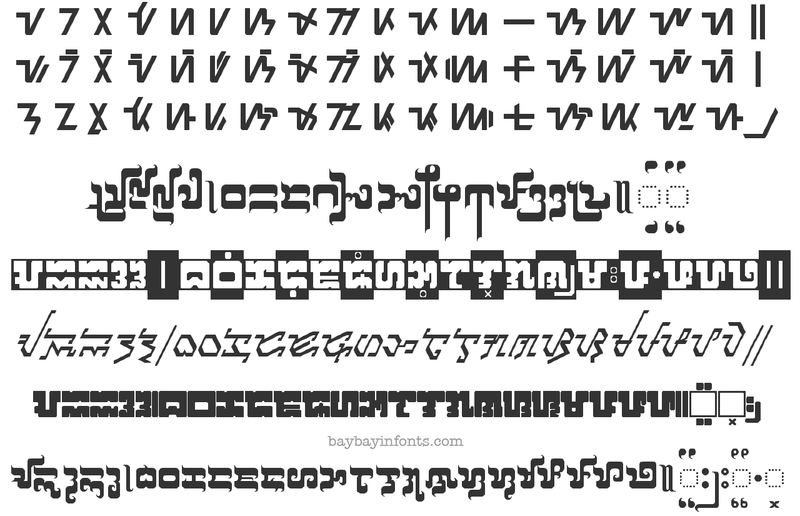 It took watching the new Star Wars: Episode VII "The Force Awakens" movie this weekend to find the boost of morale to actually finish this font set. There are a couple of tweaks and character revisions since the WIP preview I showed earlier. 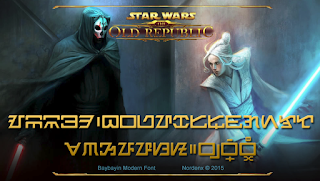 The images below contains the final letter designs. Star Wars is a TM & © of Lucasfilm Ltd.
My desktop's transition to Windows 10 from Win8+ went smoothly. I was expecting a couple of old driver issues (my youngest son had to update his video drivers) but my old machine breezed through the auto installation process. 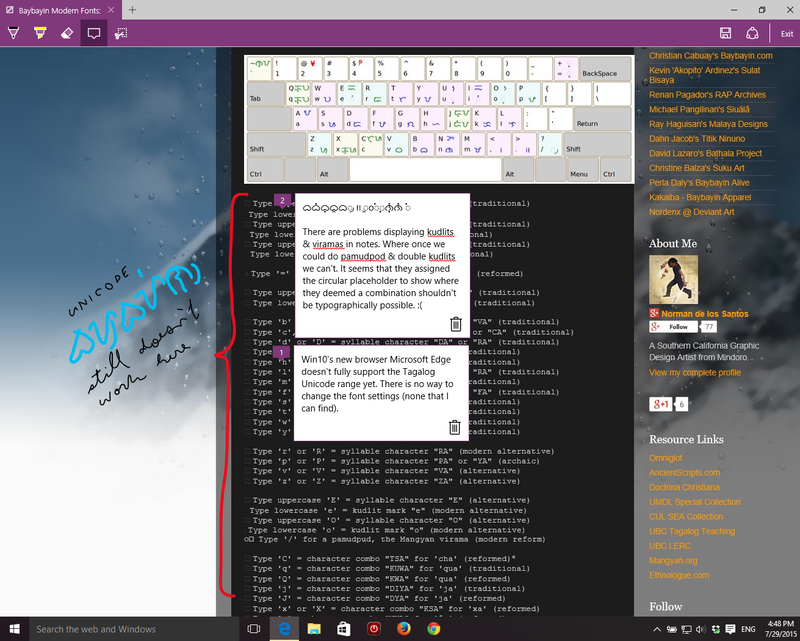 The new OS and its new Internet browser Microsoft Edge has a lot of neat little features. Edge is simplified, clean, and performs well in most cases, but it’s lacking features you might expect of a modern browser. I noticed that downloads start automatically without giving me a choice of where the files are being stored. A lot of basic stuff feels surprisingly missing. To be fair, Microsoft noted that they started from scratch with Edge. ...it shows. A neat new feature: you can post little text notes and draw all over webpages and send a copy to friends. It’s useful if you want to quickly share a screenshot of a site with some annotation, but sadly it gets old quick. But as with most browsers, the one key thing I care about is performance, and Edge mostly delivers. Edge renders most popular websites smoothly, and load times are usually good. However, as I feared, it is not fully Unicode compatible. 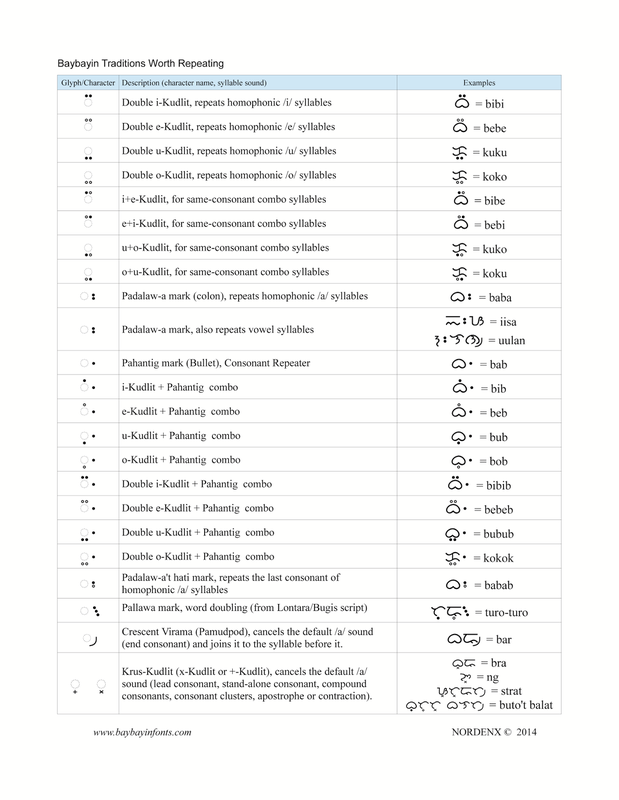 I can not find any way to change its default font settings and it does not display the Tagalog, Hanunuo, Buhid, and Tagbanwa Unicode range of characters on webpages and the new sticky-note feature has problems displaying stacked/ligatured markers (kudlit, virama, pamudpod). Character & marker combinations like the double-kudlit, possible in Firefox, is not rendered properly in Edge's notes (see image below). Baybayin deficiencies in Microsoft's new "Edge" Internet browser. The Unicode text (in parentheses) above should match the one in the image. 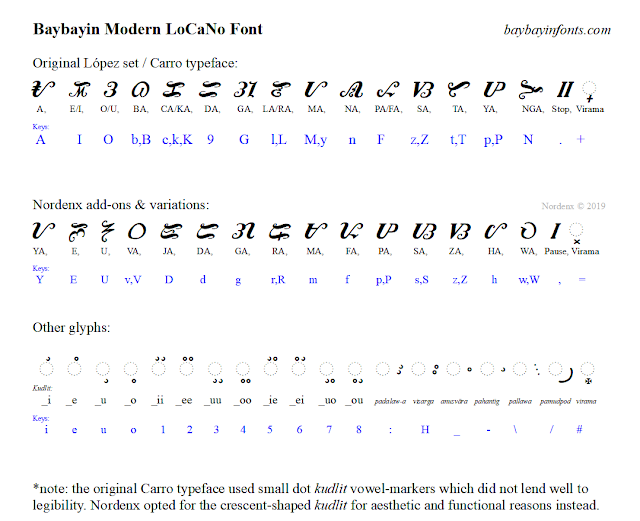 Another one of my other primary concerns is the default font keyboarding and the custom Baybayin Keyboard Layout. The only trouble I encountered was that I have to re-install the custom Segoe UI font (segoeui.ttf) and reboot my desktop afterwards. Everything else seems to be operating fine right now. 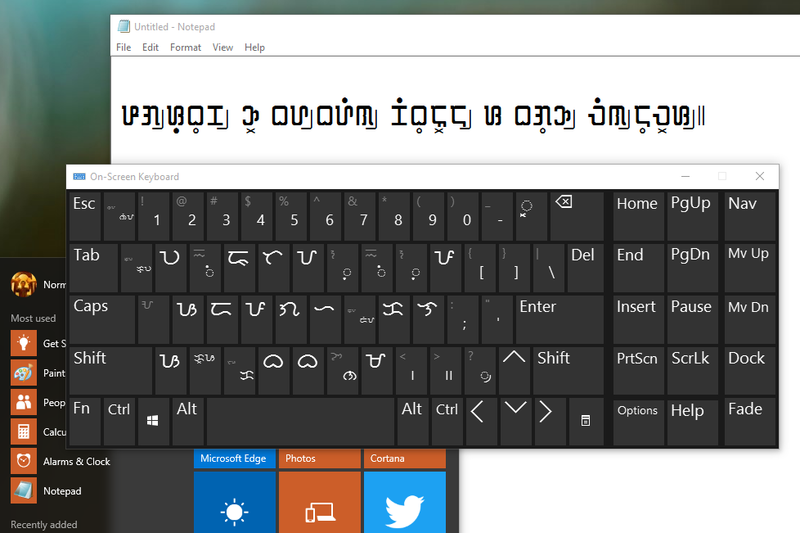 Baybayin fonts and custom keyboard layout works okay in Windows 10. The International Conference for Austronesian Linguistics (ICAL) is held every 4 years in different places all over the world. 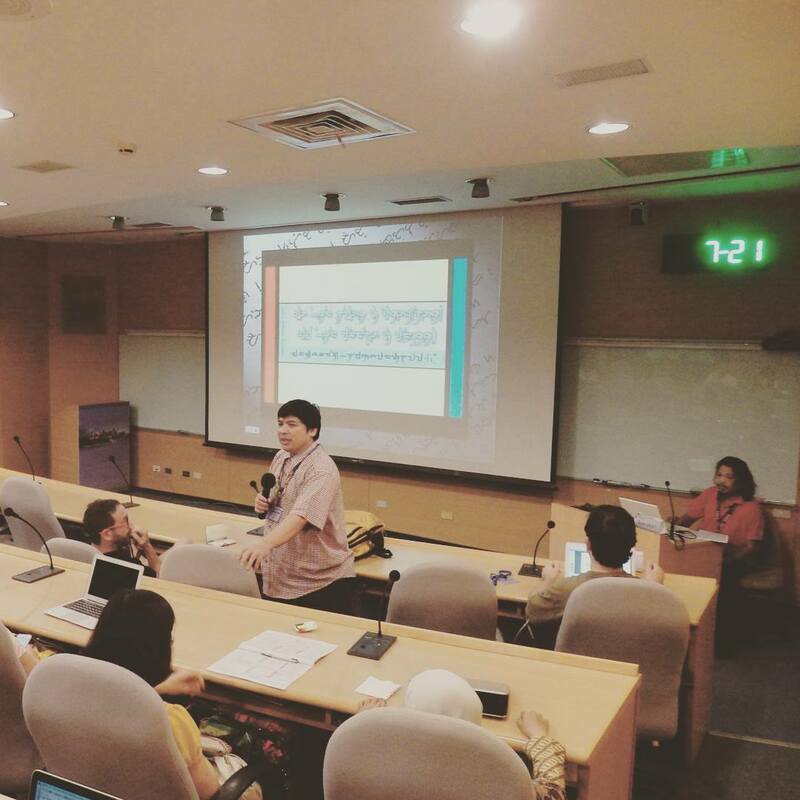 It is hosted by the Institute of Linguistics, Academia Sinica. ICAL provides forums for collaborative research and also publishes & archives research papers. When Siuálâ ding Meángûbié (Voice of the Dead) suggested that we submit a paper and present at this year's ICAL in Taiwan, I was hesitant. I know that Mike Pangilinan (Siuala) has financial limitations and so do I. 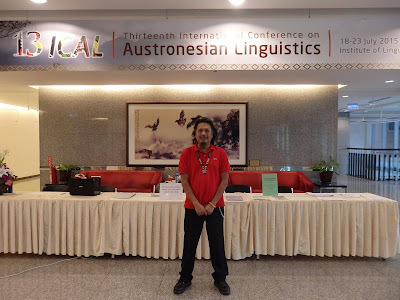 But this is another opportunity, like the one we had in Tokyo last year; to continue to showcase our work and be heard & reviewed by the academic community in an international stage. So, after some rumination, I decided that we shouldn't pass this up. We have to find a way to attend ICAL. So, for the advancement and preservation of Philippine writing systems and our cultural heritage. We decided to do a fundraising campaign to finance our trip to ICAL. Please visit our crowd-source fundraiser at: http://www.gofundme.com/nordenx2ical for more information. 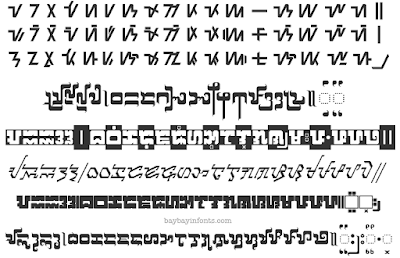 For our donors, I am currently pulling out and working on a few of my unfinished, unnamed, work-in-progress typefaces/fonts (Baybayin, Kulitan, Mangyan, etc.). 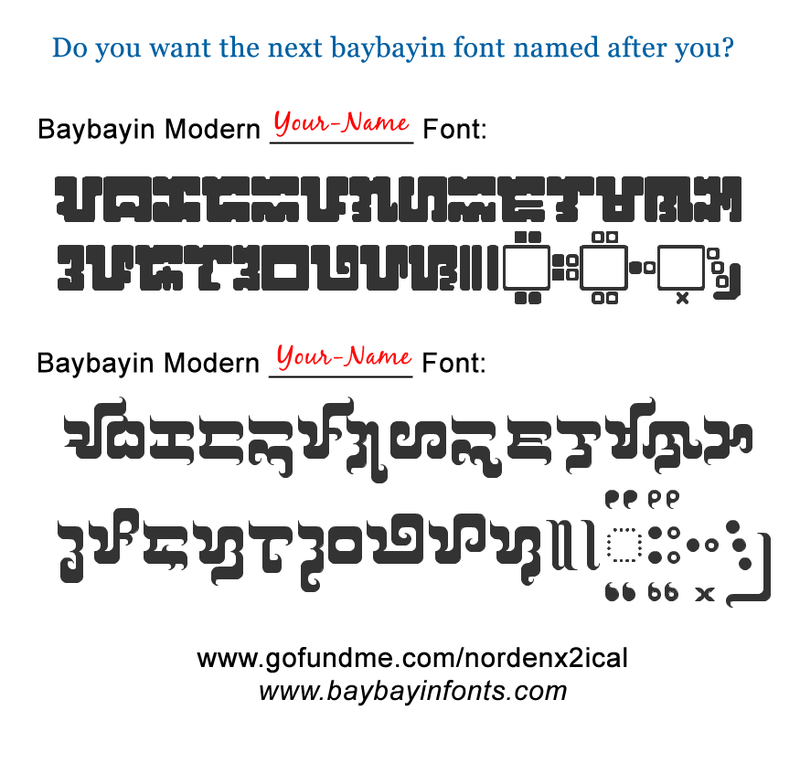 And at the end of this fund raising campaign, we will select several of our top donor's names and I will name these new typefaces/fonts in their honor. This is the highest act of gratitude that I can offer. Your name, preserved in perpetuity, typed by native script writers (poets, artists, designers, authors, scholars), as long as we strive to keep our heritage alive. 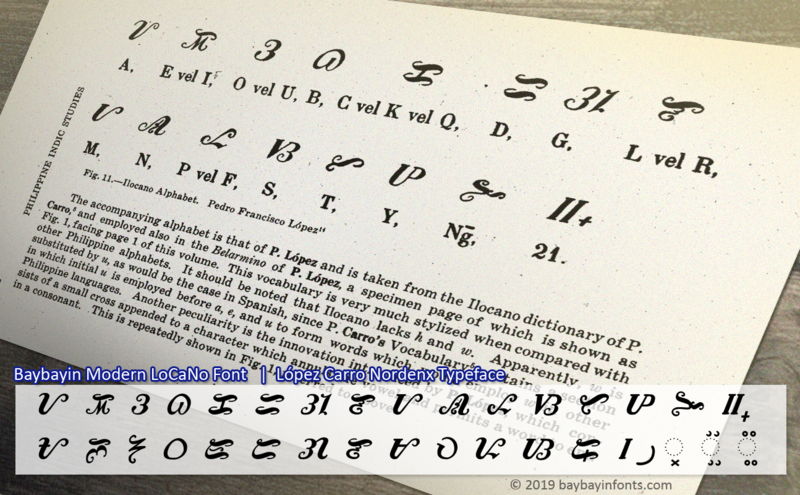 Mike and I are also sending digital copies of our donor's names in calligraphic kulitan and/or baybayin as thank you notes. Folks can donate through PayPal and we will add the amount to the gofundme total. You can use the DONATE BUTTON on the side-bar menu on this page. If you use the main PayPal site, my account is under my nordenx@yahoo.com email. For other offline modes of sending money, please contact me through email or via my facebook account and I will send you our mailing address and other necessary information. Mike can receive Peso donations from within the Philippines through local Western Union or MoneyGram type services. I can also accept checks & money order through the mail. Offline donations will also be added to our gofundme tally. We do these as part of our long-term goals to help protect and preserve our cultural heritage. I do hope that you would grace us with your generosity.